Picture the scene…the abhorred alarm begins blaring on Monday morning, and we, in our sleep-induced stupor, make the error of repeatedly banging our Essie Mint Candy Apple adorned fingertips upon the snooze button to allow ourselves a few more moments of beauty rest until we finally muster up the courage to open our eyes – still smudged with Quick Silver Metalliner from the night before, to be sure – only to discover that we have thirty minutes or less to beautify ourselves and scurry out the door. It’s an emergency of epic proportions; a crisis that will require an entire team of professionals to assemble around you and take your seen-far-better-days style and blindingly bad bedhead to a whole new level; a disaster that would snag you a spot on a makeover show without so much as an audition. Cut the dramatics darlings! Don’t be alarmed, it has happened to the best of us; and if it hasn’t, mark my words, at some point in time, when you least expect it, it will. Nevertheless, such a catastrophe does not require one to rally up the troops for assistance; nor should it leave you turning to the dreaded sweats and sloppy ponytail. You may be short on seconds, but that is no reason to be short on style; do not allow minimal time to interfere with you looking and feeling your best. Being fabulous in a flash is possible my loves…cross my heart! It is when we are in a pinch that comfort is key. Dolls, please bear in mind that we are already stressed out enough as it is, frazzled that we’ll miss the morning bus, or enter our lecture unfashionably late to the gulp-inducing glare of our Professor; therefore, ensuring that your ensemble du jour is resilient yet refined; posh yet pleasant; flexible yet fantastic, is essential for not just pleasing your inner fashionista, but your mind, body, and soul in its entirety. ♥The Fantastic Elastic Leggings are the jack of all trades to the fashion world. They manage to make appearances alongside everything from evening affairs to seaside strolls, flitting from event to event with effortless, enchanting ease, making certain that the wearer always looks her best; whilst forever guaranteeing that she is completely comfortable at all times. Hence the reason why the fantastic elastic known as leggings is the legwear of choice when attempting to style yourself in a snap! This is one of those times when you are not trying to turn heads with your choice of duds for the derriere; rather, you are seeking a canvas for the flowy top that will soon be accoutering your upper half. Therefore, skip the showstopping prints and glittering sequins, and embrace basic blacks that hit at the ankle like Velvet’s Jordan Gauzy Whisper Legging or Wilt’s Leggings. The longer length will accommodate whatever form of footwear you decide upon – be it boot, pump, or ballerina; while the noir hue creates a nice, neutral balance for any color top you deem worthy of wearing. If you truly feel the need to add an extra splash of oomph to your look, distressed pieces like David Lerner’s Shredded Supplex Leggings or Leyendecker’s Asher Bandage Leggings are ideal, as they contribute a touch of rebellious aestheticism to your appearance without forcing one to relinquish cozy repose. ♥A Tunic in Time Kitty cats please listen carefully to the words that are about to tumble from my Glow Baby Glow Sweet Talk-slathered smooch, as I’m only going to say them once…a wardrobe sans at least a handful of tunics is no wardrobe at all. It may sound slightly unbelievable, but trust me, it is the absolute truth. Tunics are the one item of clothing that retain the ability to make one look ravishing even when she is feeling ever so slightly rotund. They are a style that keep one’s silhouette looking smashing regardless of how many Little Cupcake Bakeshop desserts you’ve devoured while browsing vintage shops in Brooklyn; and, in the case of being in a hurry, they are crucial as they make you look haute with little to no fuss. When searching for a tunic that suits you to a T, seek out pieces that harbor two essential characteristics – a self-belt tie and a length that falls just below the bottom. While it’s simple to go out and buy a belt to cinch in the waist of your tunic; pieces that already feature a self-belt tie are oftentimes constructed with more shape to them to ensure that your hourglass figure is not lost by unnecessary extra material, or unflattering bagginess. mark’s All Checked Out Top, and Rebecca Taylor’s Positano Tunic are prime examples. They sport just enough slouch to keep you cozy; whilst providing you with a built-in belt to highlight your sinewy silhouette – precisely what your speedy style is looking for! ♥Dress to Impress Darlings there is no finer way to show off your femininity than via a flirty frock. Coco Chanel once said “Look for the woman in the dress. If there is no woman, there is no dress.” Such a proclamation is indicative of the power and importance of an uncomplicated frock to one’s wardrobe on a good day; but even on a bad day, when you’re in the throes of a time crunch, a dress can be the shining star of your look du jour courtesy of its simplicity and versatility. Time and time again the dress will prove to be a best friend of sorts; a close, personal confidante you might even say. It will come through at a moment’s notice, and always make sure you look like a superstar. While the little black dress is a necessity once the moon rises, and the stars come out; when the suns rays are shining brightly in the blue sky, you want something a little more playful. Remember, your harried, scrambled state instantly makes you feel unglamorous; therefore, look for a powerful print that will brighten your mood the moment you slip it on over your head. Leave the bandage dresses behind for a girls’ night out, lambs. Today you’re all about slightly slouchy, flouncy, bohemian aesthetics that proffer a sweet, ethereal vibe to anyone who looks your way. Pieces like Rebecca Taylor’s Scarlet Cami Dress, mark’s Leader of the Rack Dress, and Marc by Marc Jacobs’ Flutter Stripe Dress are the epitome of perfection. Whether worn bare-legged in the spring and summer, or coupled with tights in the fall and winter, the multifaceted quality of the dress certifies that you will look refined through and through – even when in a rush! It’s not going to happen, dolls, so shoo those thoughts away if you will. You may feel like you are the victim of an out-of-body experience by not allowing yourself to wash, blow dry, and either straighten or curl your luxurious locks this morning; but so much as attempting to alter your follicles under such a time constraint will only put you in a worse situation than you already are. No, today is the day to grab a bottle of dry shampoo, such as mark’s Mega Volume Next Day Spray, to reduce the appearance of grease, oil, and dirt; and get down to quick styling – the slapdash pony will not be seen today! ♥Chaotic Chignon The messy pony has a tendency to make one look rumpled and unrefined, as if they have just rolled out of bed and strolled out the door without so much as taking a comb to their mattress-matted hair; whereas the chaotic chignon, which takes just as little time to achieve, retains the ability to make one look glamorous in every sense of the word. The beauty of the chaotic chignon, most commonly known as the messy bun, is that it is all in the eye of the beholder; there is no specific technique to achieve euphoria in the form of a bun, it is simply created with practice. I like to begin with an elastic hair tie, pulling my hair into a mid-range ponytail, then, once secure, pulling my pony halfway through the elastic so that it sticks out in the form of a bun. Once this is complete, run your fingers around your hairline to pull strands out that will frame your face and create more disorder to your ‘do. Add a coquettish headpiece, like mark’s Petal Perfect Headband to liven up your look, or merely wear as is – either way is sensational! ♥Magnificently Mussed Kitty cats there is absolutely nothing wrong with rocking the bedhead, as long as your look is intentional. Avoid the tangled look created by the assistance of a restless night full of tossing and turning and think more along the lines of salt water saturated waves. Run a comb through your hair to remove knots; then spray a mist such as mark’s Curl Goddess Curling Mist with Conditioning Sunflower all over, scrunching and finger-combing as you go along to work the product into each strand. The end result is the perfect blend of boho / beachy beauty – and it’s a cinch to comb out once the day is over! ♥Perky Pony Darlings you have not been forbidden from perusing ponytails in general; you’ve simply been warned against the hazards of the messy pony. The perky pony is in a class all its own. The perky pony sits high atop your head, swishing to and fro with every strut you take, a subtle wave to the world proclaiming that you are chipper from head to toe regardless of how jittery you may be feeling inside given your late start; thus the reason it is a wonderful go-to ‘do for those hustle and bustle days. Pick your placement point, either the middle of the back of the head, or a bit higher for that true peppy effect; scoop your hair back, running a smoothing balm such as mark’s Salon Straight Anti-Frizz Serum with Invigorating Orange through your locks, to smooth flyaways and give you that sleek look; secure with a hair tie and voila! Good to go! For a truly elegant addition, wrap a thick strand of hair around your elastic and pin it in place to conceal your hair tie; then fix a pair of oversized sunglasses, such as Chloe Sunglasses’ Abelie Rounded Sunglasses or mark’s Soho Shades atop your head to truly make yourself feel like a starlet! ♥A Side of Sass There’s no point in even trying to deny it, the proof is in the pictures…we were all victims of the Pippi Longstocking-inspired hairstyle during our adolescence; forced to sit still as our mothers wove our tresses into tight braids flanking either side of our head, rendering our facial muscles nearly immobile. It was an acceptable form of torture which left a loathing towards braids forever emblazoned in our minds. Rid your brain of those bad memories my loves! The side braid is an updated take on the playground motif; an unfussy yet fabulous way to style in a snap! Simply gather your hair over one shoulder, loosely weave it into a plait, and off you go – allow wayward tendrils to straggle seductively around your face; they’re par for the course when it comes to achieving a side of sass! You may be the absolute queen of smoky eyes, or the master of sculpting perfect cheekbones with a few simple swipes of a makeup brush; but today dramatics are not on the agenda. You do not have the time to create a cosmetic look worthy of a fashion editorial; nor does this morning’s speedy schedule allow for you to try out a new style. Today’s mission is merely to make yourself look presentable to the outside world in as little time as humanly possible; thus, you will only be needing a few essentials from your makeup drawer. ♥It’s All About the Tint A tinted moisturizer is to a girls cosmetic bag what conversation hearts are to Valentine’s Day…not a maybe, not a might, but an absolute must! Tinted moisturizers like mark’s Get A Tint Tinted Moisturizer Lotion with SPF 15 work overtime, performing double-duty by not only evening out your skin tone and covering up any redness you may have; but by bringing forth your natural beauty by moisturizing and giving you a dewy glow which lasts all day. Use a sponge to lightly cover your entire face, and you’re ready for the next step! ♥Eyes on the Prize Don’t be ashamed to admit it dolls, many of us are guilty of the very same crime…we have grown reliant upon eye makeup, and the way that it transforms our sleepy peepers into bright, bushytailed beauties that dazzle; so much so, in fact, that our eyes completely disappear whenever we are sans such embellishment. We may lack the time to use our beloved purple shadows or electric blue liners this morning; but one thing you must not forgo is mascara. Swipe a coat or two of mark’s Make It Big Lash Plumping Mascara on your upper and lower lashes to open up your eyes, and give yourself the confidence boost you need to truly sparkle! ♥The Power of the Pout There is something about a pretty pout that will forever be alluring; and, as your mouth is the focus of conversation, you want to ensure that your lips look lovely through and through. Skip the lipstick this morning, and go for something slightly more subtle with just as many beguiling capabilities. When you’re in a rush your cosmetic crew consists of lip tints, glosses, and stains. Tints like mark’s Glossblossom Ripening Lip Tint give you a sophisticated hint of color with delicate shine; stains such as mark’s Kissink Lip Tintmarker provide a matte finish with long-lasting color; and a gloss like mark’s Pro Gloss Hook Up Plumping Lip Shine add a lacquered look to your lips. The choice is yours my loves! ♥Posh in a Pinch Never would I do that to you darlings! Never would I leave you without at least a few ensemble ideas to put you on the fast track to being fashionable in a flash. You may be in a pinch for time, but that is no reason to forgo your posh persona. These looks will keep you from having to do so; and give you a bit of inspiration for future speedy style! ♥Velvet’s Jordan Gauzy Whisper Leggings topped with mark’s All Checked Out Top, and paired with Frye’s Veronica Slouch Boots. A magnificently mussed mane will make you look wild and spontaneous – perfect for this style! ♥Marc by Marc Jacobs’ Flutter Stripe Dress coupled with Dolce Vita’s Beam Platform Pumps in Desert. Pull your hair into a perky pony to embrace your sophisticated side. ♥Rebecca Taylor’s Positano Tunic styled over David Lerner’s Shredded Supplex Leggings and worn with 7 For All Mankind’s Beetle Ballet Flats with Ankle Strap in Black. A saucy side braid would work wonders for this look! Thanks to Tumblr and Shopbop for the pictures. Don't forget to enter the Dress of Your Dreams Giveaway for your chance to win the dress of your choice from Lulu*s.
This post is so relatable, and I dig your recommendations. Thanks! love all the inspiring photos and your fab advice! Leggings rule! Ah! Fantastic post, as usual! I may have to buy the mark checkered top! Love your blog, as usual, and especially the layout! This is such a cute post! Such helpful tricks. And I have to say....that girl in the sixth picture has fabulous hair! Holy crap girl.. This post is BRILLIANT> I love it!!!! Oh and lastly ... Thanks for the turn on to the Little Cupcake Bakeshop... Im dyin for some right now!!! Erika, this is a really great post, wow! Wise advise as always! The colorful dresses are very beautiful! I love when I wear dresses and people comment on how much time I must spend getting ready in the morning. I can't help but giggle - slipping on a dress and pulling back my hair is the easy way out in the morning! love this post! and I must agree, leggings, tunics, and high pony tails are a "go-to" in a rush. When I'm in a rush, the one thing I concentrate on is my hair. If the hair looks good, everything else falls into place! Leggings are so good when you're on the go. I have a similar nail polish color than this last lipstick. Mhmmmmm. :-) I love it so much! Darling what a GREAT post! useful advice and so much fun! wow. Lots of great ideas here ... I think, too, that a great scarf does wonders, with all its options, to dress up a rushed morning outfit! Yes to all of this! Wonderful post. It is definitely the story of my life. I must be obsessed because throughout the whole article I just kept thinking of mint candy apple nailpolish — I think I'm going to go ahead and paint my nails now! I've never been a leggings girl but I might have to start when I go to a wedding in March that is all outdoors and it will be cold! love your quotes, where do you find these? wonderful post. I'm often in a hurry in the morning. unfortunately too often. Thanks for the great help! Gaahhhh! I want EVERYTHING you talked about. Seriously. It's like torture. Lol. I need to win the lottery asap. Because I don't think I can live without those shredded black leggings...or that plumping lip shine. Sigh. I hope your weekend is fab! Darling this post must have taken you for.ever. I loved it aall - you by far give the best tips and advice of all the blogs I adore. Love the Winnie the Pooh quote! Being fashionable in a flash! That is exactly what life demands from us. It takes me around 20 minutes to get ready. Every day I do it faster!! Great post! I've definitely been in this situation before! I'll definitely take this advice for next time. Throwing on a cute dress is a great idea! How do you know my mornings so well, Erika?!? But leggings, tunics and a fabulous lip colour will from now on save my day! I love the comfort and sleekness of leggings and a tunic, it's my staple wardrobe. However, I never thought of tunics with built in belts would streamline the body more than throwing on my own belt. great stuff! Being in a hurry sure is like this. My advice: take one lazy Sunday to peruse your wardrobe and try on different combinations for easy, chic outfits. Keep these in your repertoire for such a time as this, so all you have to do is a quick beauty prep and the hardest part of "What to wear" is already taken care of! I adore every pictures ! Erikkkkaaaaaa!!! You've taken my heart away with that magnificent finger-licking-good writing!! While many do not need words, the one thing that many a fashion bloggers lack is the art of adding substance to the pictures they post using the power of words but girl, you seem to have it all!! It was such a treat reading this! I wish there were more fashion and design blogs with interesting reads as well! Your posts just keep getting better and better. :) This is completely my lazy-late-day uniform. As I mentioned on my blog, I have chronic fatigue syndrome, so I often sleep too late or need to conserve my energy. I love easy outfits and makeup fixed-- leggings + tunics, a chic updo, simple mascara, concealer, blush combo-- perfect. Jessica-- great idea about the lazy Sunday afternoon wardrobe sesh. That's what they do on that funny British version of What Not to Wear (the one where they run around dressing American women and grabbing their bottoms?). They post pictures of the outfits on the closet doors so that they will be able to dress chicly at the drop of a hat. Brilliant. I just can't phantom anything ripped at the moment in our cold cold weather. Funny, its last year news but at our school, ripped things were outlawed which brought an up roar. Its kind of funny when I think of it now. Anyhow, leggins are so great under a frock, plaid shirts or what not. Just something extra to protect you from the cold. Great stuff about gloss and protection from the sun too! oh, and Kip gets the call tomorrow! I'm loving this post, Erika! :) It takes me too long to get ready so this is perfect for those days when I don't have a lot of time. I'm especially loving all the mark recommendations. Fab! Oh gosh, this is my everyday lifesaver. Shall follow it religiously, thank you!!! Great post! These are perfect outfit tips, lovely. You clearly know my morning routine well. It is slow and way groggy! I love the suggestions! (especially on the dress/tunic making an easy and polished outfit...) I agree, there are always going to be those times when you're in a rush but don't want to just throw on some jeans and a tshirt and call it a day! Erika my dear, you summed everything so well... absolutely everything! I love this post. And there goes the side braid again... hahaha! I want one but I can't do it. This post was fantastic! God knows I've had a few morning when I woke up and was like WHAT?! I have class in 10 minutes?! And I 100% agree, leggings are seriously a jack of all trades... I love 'em and I hope they stick around for a long time. Fabulous post my darling! I am absolutely loving all your suggestions. One way to instantly up the glam factor of a rushed outfit, gorgeous hair accessories. These are so useful cos they distract the observers from your less than usually pristine locks and are such a quick n easy remedy. One of my fave posts of yours ever! Such great tips! & that opening quote made me giggle - SO TRUE! Darling girl! Oh my goodness, this is perfect for me right now. As you can tell, I haven't commented in so long because I've been SO STRESSED to the point where blogging seems less important! Thanks for the tips, now maybe I'll start looking more put-together even though I'm still sick! Take care, and I truly appreciate your sentiments on my blog today. Where oh where do I get dry shampoo in Manila ... Waah! We are always so behind ... but at least I find about these things from you, Erika! I'm not much of a makeup maven, but a pretty pout is something I cannot go out without...and leggings. J'adore! Umm...amazing post!!!! I am so impressed by your advice, writing, and editing. Lovesss. i'm loving all the photos! I feel like my whole life is getting ready in a rush, so this is perfect. This is sooo good, so true on my late days (or the days when the BF is hurrying me!) I am a dress girl for easy dressing myself and if I need to go in a hurry, I'm never without mascara...This is such a good post! This is simply the best post ever. It's such a great guide to style and fashion advice. I'm about to go buy some tunics right now! I love the ponytail picture! 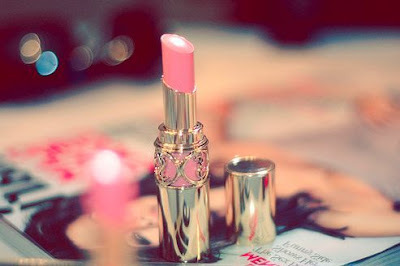 And I love the pink lipstick! Erica the quote made me crack up!! I agree about the tunics, I love them. They look awesome tucked in too, it was like I had a whole new wardrobe when I realized that. The leggings you recommended look amazing as well as all of your other advice! 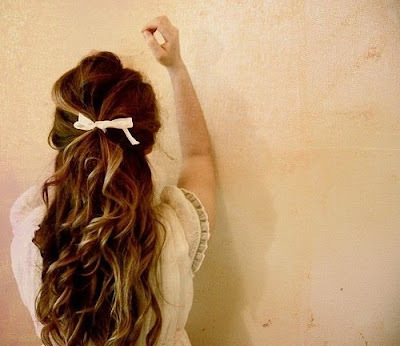 I wish I could make my hair that pretty! Love this post - I feel that I need to always have a go-to outfit for those days when I'm running late! this post is much needed! i'll have to keep this in mind if I'm ever wanting to be lazy and put on a tshirt and black yoga pants LOL! Absolutely fantastic post doll! I feel like I need to print it out and keep it by my bed for those mornings when I'm so tempted to just roll out and leave in my jammers. Great advice and love your sassy way of writing. Great post.